The Bluenose II went back in the water last week. I feel a lot better now. As a symbol the old (built 1963) horribly hogged Bluenose II was an embarrassment. The new laminated structure will hold her shape for many decades to come, a wise investment. So now we’ll have a circus of lawyers and “experts” pontificating as whether this is really Bluenose II or actually Bluenose III, or maybe Bluenose IV!! Is this important? No, not really. 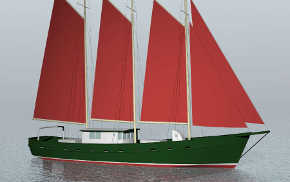 What is important is that a bunch of guys built a big wooden fishing schooner as close to the original 1921 boat as they could get. And now she’ll take a good many folks sailing, and continue to serve as a Canadian symbol we can be proud of. 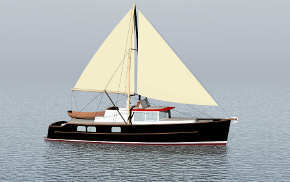 I take pride in the traditions of craftsmanship and skill represented by her design, construction, and sailing. I’m appalled by the political posturing attached. It’s a re-build or restoration as the hull was not in two places at one time (which used to be a standard). 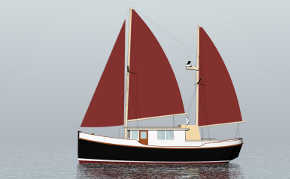 William Roue designed her in 1921. I’m not clear on how close the current vessel is to the original, there are certainly differences. But respect is due to the designers’ contribution. How that transfers to his heirs I’m not sure…..
I’m not sure of the timing of various phases of the work and don’t argue that her hull is completely rebuilt. But how do we assign value to bits and pieces of old boat? Someone mentioned her rudder being re-used, also her “rig”, whether that means all spars/sails/wire/rope or bits and pieces I don’t know. mentions Bluenose landing “a record” 646,000 pounds in 1923, so she fished more than one season and “paid her way”. Her total fishing record is unclear but the racing ended in 1938 (beginning of WWII) by which time she was in rough shape. I found this little book with some history of her fishing. 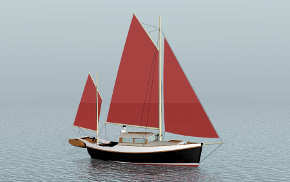 The Story of the Bluenose, published in 1935. The book states she fished at least 12 seasons, 3-4 trips per year, each trip 6-8 weeks in length. The big landing mentioned above (646,000 pounds) was actually the largest single landing by any schooner. She is not identical to the original as she has to meet current Transport Canada requirements. She is currently (on-line) registered as a “Cargo” vessel. How exactly they will deal with the regulations remains to be seen, I did note relatively huge scuppers….The current “Carrying Passengers Under Sail” stability requirements are fairly stringent. 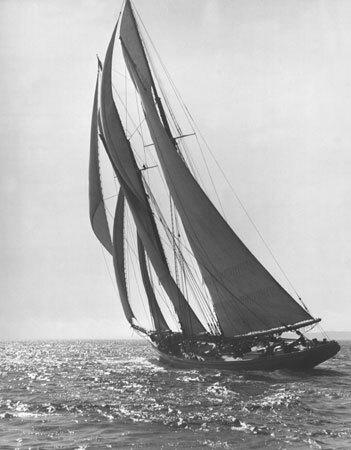 I’ve included the fishing history above as someone mentioned that she wasn’t a “real” fishing schooner, but rather a racing yacht that put in one fishing season to meet the racing rule. “Making money” means different things to different people…… …….Angus Walters was her major shareholder, he was not rich, and (it’s reported) he sold her south because he could not afford the upkeep. The wealth generated by the grand bank is almost unimaginable now, oh to have just a fraction of it back……..
Now if the Americans would build a new McManus or Burgess schooner. And if the Lawyers, Politicians, and Insurance underwriters could be convinced that not too many people would drown…..This racing thing could be settled once and for all……well maybe, if we could find a young Angus Walters and 20 others to sail her hard.